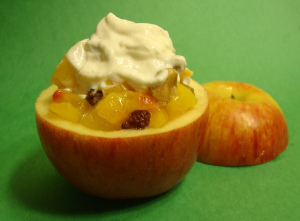 "Apple bowls are easy to adapt for Tu B’Shevat. You and your child can hollow an apple—the paradigmatic tree fruit—and fill it with tree fruit salad. It’s easy with a melon-baller, and the only trick is not to get too energetic and pierce the peel from the inside. Kids can even prepare the fruit for the thematic contents using double-handled apple slicer/corer combos and Montessori-style slicing tools. Depending on the palate (e.g. pickiness) of the child in question, you can get pretty elaborate with the tree theme. Besides typical lunch-box fruit—typical for my kid, whose lunch-box is exquisitely boring—try coconut, apricot, citrus, papaya, mango, kiwi, plums, cherries, star fruit, and tree nuts galore."